Artisan of Beauty, a Beverly Hills, CA plastic surgery medical practice under the direction of board-certified surgeon Dr. Tim Neavin, is now offering one of the latest in hair transplant technology – the NeoGraft automated FUE hair transplant system. Dr. Neavin is one of the only surgeons in the Los Angeles area to offer this specialty hair transplant that offers a full and natural-looking hairline without the unsightly linear scar associated with traditional strip removal hair transplants.The follicular unit extraction (FUE) hair transplant is desirable for both men and women because it does not leave a visible scar in the donor area, where healthy hair is harvested; however, it’s a very time intensive procedure when the physician has to collect and place each hair follicle individually. The FDA-approved NeoGraft automates the surgical removal, collection and placement of individual hair follicles and allows for the precise placement of new hair follicles in a timelier manner with a reduced recovery time. The end-result is a full and natural-looking hairline without the unsightly linear scar associated with traditional strip removal hair transplants. Least invasive procedure for hair transplantation, patients feel little to no discomfort. No linear scar or numbness where the donor hair is harvested. Less activity restrictions after surgery, patients can typically go back to work the next day. Very short haircuts are possible after surgery. Transplants roughly twice as many hair grafts as manually performed FUE surgery. 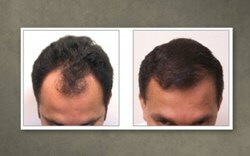 Permanent hair growth within 6 – 8 months. Board-certified Beverly Hills plastic surgeon, Dr. Tim Neavin specializes in facial rejuvenation and reshaping, breast augmentation and hair restoration. Artisan of Beauty is located at 9615 Brighton Way, Suite 303, Beverly Hills, CA 90210.